DOWNTOWN BROOKLYN — College student Chaila McKoy has bounced in and out of shelters since she was first homeless at age 21. But she has never felt more unsafe than she does in the place she currently calls home. McKoy stays in the city-funded Tillary Street Women’s Shelter, the 200-bed facility alongside the Ingersoll Houses, which thousands of people pass every day as they drive onto the Brooklyn-Queens Expressway. Records show the shelter at 200 Tillary St., a quick walk from the high-rise apartments of downtown Brooklyn, has been plagued by violence — with police called to the facility at least nine times since the end of December. "The dorm rooms aren't locked at night and it feels very unsafe," said McCoy, 24, who is studying early childhood development at a four-year college in Manhattan and was left homeless when her mother was admitted to a nursing home. "The females in here are dangerous." The shelter, which serves women with mental illnesses ranging from depression to more severe diagnoses, has struggled to maintain security in the face of fights between residents. Weapons used in these fights have included a combination lock, garbage can, cellphones, a 7up bottle, crutches, cups, a wet-floor sign and a chunk of a wooden police barrier over the past year, according to reports. On Dec. 23, two residents were arrested and charged with pummeling each other with hangers during an argument, according to police and local media. On Feb. 21, a 52-year-old resident was punched in the face and hit with a garbage can for cutting the cafeteria line and had to be hospitalized, according to police reports. And on March 3, a 44-year-old resident was arrested for beating her roommate with a cane. Details on arrests and the identities of those involved were not released. Police also did not release the exact number of times they were called to the shelter during the last year. But a spokeswoman for the Department of Homeless Services (DHS), which oversees the shelter, said police calls are common at mental health shelters. Police were called to Tillary Street Women’s Shelter nearly every day when it first opened in 2003, she added. "It is a challenging population," said spokeswoman Lisa Black, adding that the Tillary Street shelter does not stand out as particularly violent among the approximately 70 homeless shelters the agency oversees. "There are a lot of resources, including police, that need to be brought there." The shelter currently has a metal detector and 15 security staff members, officials said. It has not received any citations, Black said. Forty-two families were moved from a shelter just three blocks east, at 39 Auburn Place, after it received more than 400 violations for the presence of sexual predators, vermin, mold, lead exposure and an inoperable fire safety system, according to The New York Times. Another 64 families will be moved out of the Auburn Family Residence by late June, the paper reported. Black said that while DHS tracks major incidents like "stabbings, elevator malfunctions, fires and other incidents that affect the clients," it does not have reports on fights among residents. DHS provides regular training with shelter staff on how to de-escalate fights and violence, she said. The shelter serves women dealing with the full range of mental illnesses and mixes together clients of varying diagnoses in rooms with nine beds each, staffers at the shelter said. For McKoy — who said she has never been in a fight and suffers from depression — the situation feels particularly dangerous. "You don’t know who could run up in your dorm room and smother you or beat you up when you're asleep," she said. 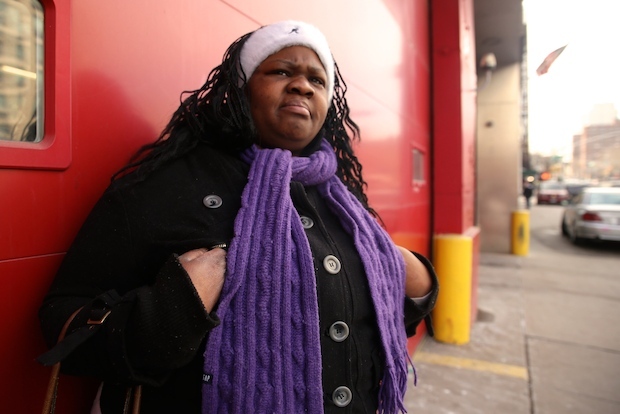 But the South Bronx native said she doesn't have another option since she was abruptly moved from her former shelter, Susan's Place in the Bronx, on Jan. 15. That 200-bed shelter also serves women with mental illnesses. McKoy said there were hardly any fights at Susan's Place and the environment felt safer. So while McKoy waits for DHS to find her permanent housing, she keeps a regular schedule studying, attending classes, visiting friends and dropping in on her mother. She said she plans to start a new job in April. "I have a lot of good things going on for me besides being here and living in this place," she said. "That’s the only thing that’s a bad situation for me right now."